Recycling is one of those things that I think most people want to do. It can be hard to get started, though, especially if you just aren’t very familiar with the logistics of it. I don’t think my parents even get recycling pickup on their street so it definitely wasn’t something I grew up with, but when I moved out of my college apartment into my first rental house I wanted to give it a try. We’re lucky to have single-stream recycling here in Baton Rouge. That means we don’t have to sort! We just throw all of our recyclables into the big container provided and it gets picked up from the curb once a week. Despite the ease of this system it still took us a long time to get into the habit of recycling. One thing that really helped was to get two identical trashcans and place them next to each other–one for trash, one for recycling. Nick still struggled to remember what was recyclable and I was constantly harping on him for throwing aluminum cans in the trash. 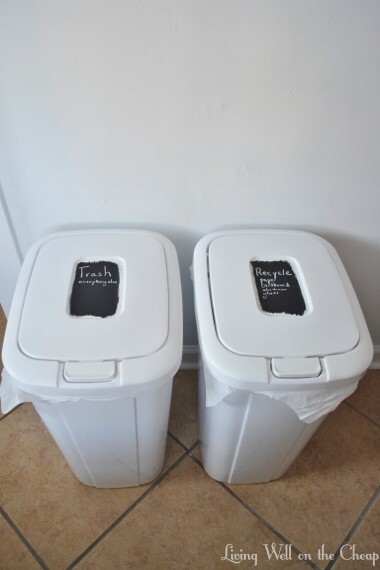 After consulting our parish’s recycling website for the specifics of what can and cannot be recycled I used chalkboard paint to label the cans accordingly. This has been a big help! It basically boils down to paper, cardboard, aluminum, and glass. Paper or cardboard with a waxy coating, plastic bags, and aluminum foil are a no-no. I don’t understand why, but I try to accept it. And I actually probably need to re-write the descriptions on top of the containers pictured above to be more specific. Containers used to hold food, household cleaners, etc. should be emptied and rinsed. Also, even though we use a bag to line the container, since plastic bags are not recyclable (???) we just dump the contents of the bag into the big bin outside instead of tying it up like we do with our trash. I think every community’s rules for recycling are different, and the best thing you can do is to use your friend google to find your city, parish, or county’s website for curbside recycling. If pickup isn’t offered at your home but you really want to do Mother Earth a favor, maybe you could save up your recyclables to bring to a friend or family’s house where recycling is available. Or find a recycling center that accepts materials directly. Maybe you could even get some money back for all those cans! And if your community doesn’t offer single-stream recycling (aka you have to sort) you can find lots of tips on how to streamline that process via the internet–here are some links to get you started: Better Homes & Gardens: 16 Ways to Organize Your Recycling, Curbly: 8 Clever DIY Ways to Organize Your Recycling, Huffington Post: Organize your Recycling. I hope this helps those of you who’ve been feeling guilty for not recycling, and maybe even if you’ve been recycling for years you’ve picked up an idea or two on how to make it simpler. I sure do sleep well at night knowing we’re doing our best to keep those landfills from overflowing.